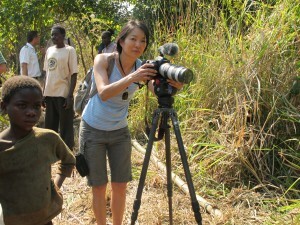 Jessica Yu’s documentary filmmaking record is impeccable. In 1996, she took home an Academy Award for “Breathing Lessons.” This month, she’ll be honored as a tribute filmmaker at the prestigious Full Frame Documentary Film Festival in Durham, North Carolina. You’d think that someone who has done so well in the film industry would have always wanted to be in it, but despite her success, Yu’s interest in movies was a gradual one. “It wasn’t like the first time I got to hold a camera, I said, ‘This is for me!’” she says. Instead, she attributes her attraction to documentaries to growing up as a daughter of political activists and sitting around at picket lines as a child. But Yu’s best advice? To live day by day. Yu remembers how she always looked ahead toward her future when she first began pursuing filmmaking, but now she knows better. Today, she lives project to project, so that she can celebrate each little success for what it is—and, of course, enjoy her kids. Which is far more rewarding than stressing about the big picture ever was.